Over the years, RainyDayMagazine has looked at a lot of accessories—cases, mounts, etc.—for smartphones and tablets and the like. While accessories designed for a specific device have their advantages, our preference has always been toward those which are more versatile. One reason is that we don’t have to/want to repurchase the same accessories when we upgrade. The other is we can sometimes use them for things with a similar form factor in a completely different context. LapWorks have been one of our “go to” sources for stands and mounts. They have a huge selection of gear which is well designed and built to last. So when we were thinking of getting an iPad Pro, we got their RoboTX mount so we could place the tablet next to the desk and use it in a Cintiq-like fashion. However, after checking out the iPad Pro, we decided we could get by with a Wacom Intuos instead. 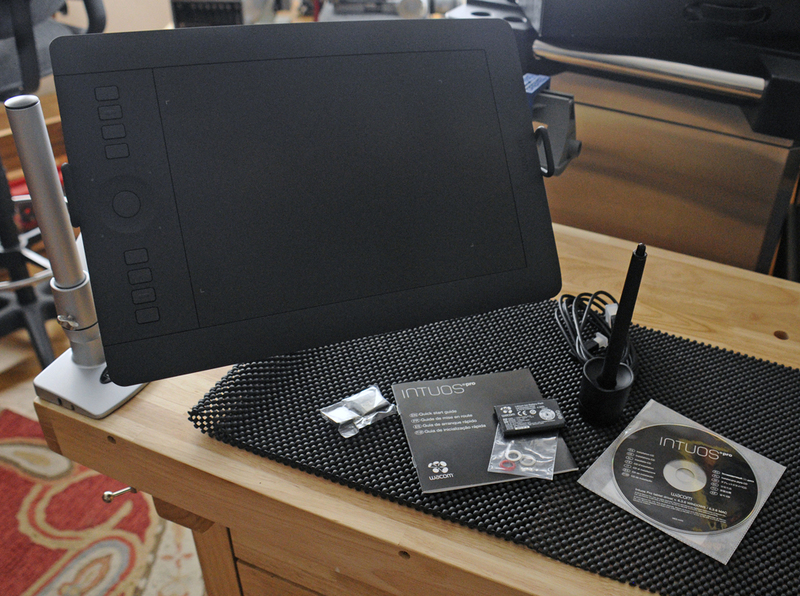 Now the RoboTX can accommodate tablets up to 11 inches in width, but the Wacom is about an inch too wide for the grip. Fortunately, LapWorks cleverly designed their products such that some of the pieces may be intermixed! 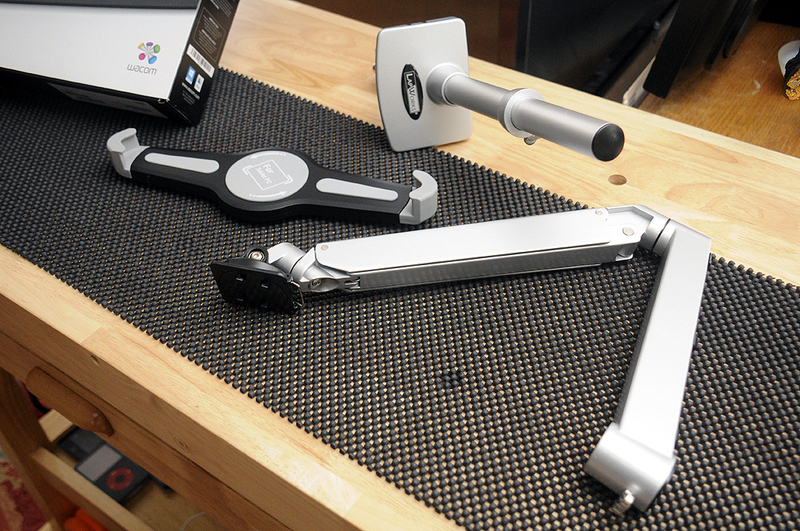 Their GripZilla, with a span of up to 14 inches, would comfortably handle the Wacom tablet AND will attach to the RoboTX arm. How awesome is that??? 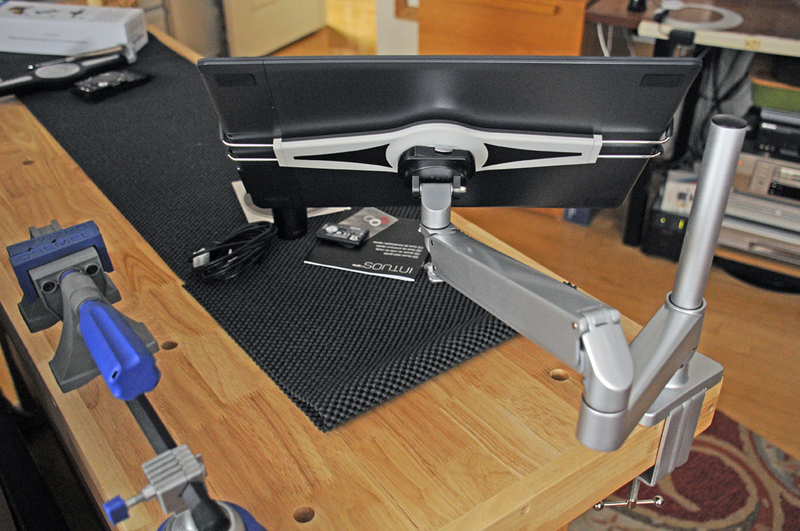 The RoboTX desk mount consists of three pieces: the variable-width grip, the multi-position arm, and the height-adjustable clamp. The grip is high-strength plastic with padded ends, and the arm and the clamp are made of machined aluminum. The action is smooth and the fit and finish on the pieces are excellent. Tighten the bolts once things are in the desired position. The ends of the GripZilla are rubber coated, so it offers a good hold without marring. The Wacom Intuos is actually lighter than a typical tablet of that size, so the GripZilla has no problem holding it securely in place. The flexibility of the RoboTX is its ability to rotate 360º at three different axis points and extends 20 inches from anchor post. It can elevate, lift, tilt, and rotate to provide the viewing angle that works best. Unlike a wall mount, the C-clamp allows the mount to be moved around as well. 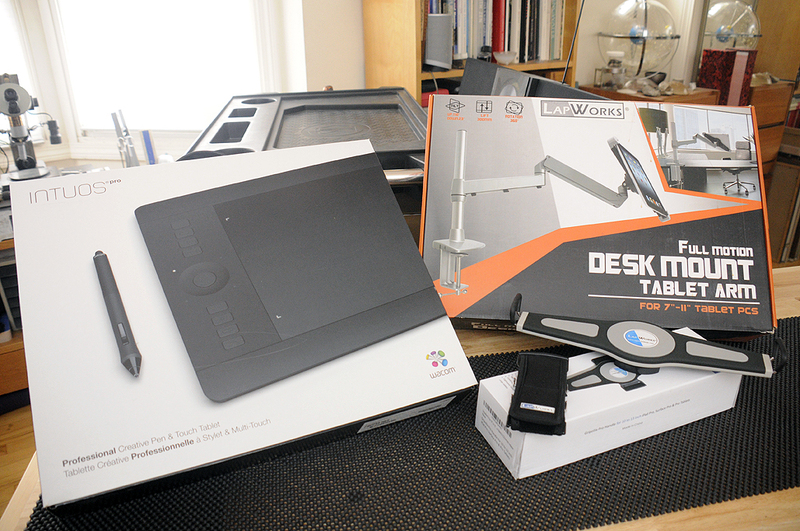 Today, the LapWorks RoboTX is holding up our Wacom Intuos tablet, but who knows what we’ll be using it for in the future. What we do know is that because the LapWorks RoboTX is not tied to a specific device, it’s usefulness will continue even when the device it is now holding has gone past its prime. Now that is utility!